My Flight Blog: Pancakes, Hot Dogs and Flying...What a Saturday! Pancakes, Hot Dogs and Flying...What a Saturday! While learning to fly I have seen proof that pilots will use any excuse to fly. One of the more famous excuses is to enjoy the $100 Hamburger. When a pilot flies to another airport to get lunch in another town it is considered a $100 hamburger because of the cost of the flight. In today's lesson I came across some more excuses to fly. My local airport was having a pancake breakfast fly-in this morning. Pilots were invited to fly in for a pancake breakfast and while the pilots eat they could have their aircraft washed for a fee. My airport was not the only one in the area inviting pilots in for food today. Sporty's Pilot Shop based at the Clermont Airport was offering free hot dogs for pilots who flew in. So this morning before my flight my Wife and I drove over to Blue Ash and ate some pancakes, cooked by members of the international aviation fraternity, Alpha Eta Rho. My wife then had her first opportunity to watch me pre-flight with the instructor and take-off towards Clermont. I am finding that each lesson becomes my best lesson yet. I really enjoyed today's flight because instead of just doing maneuvers, we really went out and flew to a few different airports. When we were in the downwind leg of the traffic pattern at Clermont, my instructor pulled the throttle out and asked me to simulate an engine-out emergency landing. I was able to complete the final turns and line the plane up on final approach and glide the plane down for a smooth landing. Since I had filled up on pancakes back at Blue Ash, we passed on the free hot dogs and took off towards Lunken. 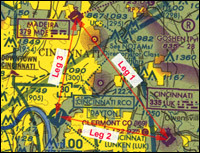 Lunken is the first airport I trained at and is a controlled airport. After spending the last two lessons at uncontrolled fields it took a moment to remember the protocol. I think my tower tour helped my confidence in talking with the tower. We made a nice landing at Lunken then turned north to return to a busy traffic pattern at Blue Ash. We flew into line following two planes ahead of us and 1 behind us and maneuvered through the traffic pattern. Once the plane ahead of me cleared the runway I brought the C-152 down nice and easy onto the runway, completing my longest flight yet. I logged 1.5 hours, performing 5 take-off and landings at three different airports. I am not sure I will need excuses like pancakes, hot dogs or hamburgers to go flying on a beautiful Saturday but it sure doesn't hurt.